Relocation of raccoons is illegal in Oregon: Raccoons are protected under state law and relocation of these animals is illegal. Raccoons may be trapped with a permit from the Oregon Department of Fish and Wildlife, but they must be released at the same site or euthanized. Learn more. 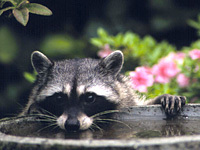 Raccoons have adapted well to residential life because they are primarily nighttime feeders. They find lots of places to hide during the day, and foods they thrive on are often readily available. Don't leave pet food outside. Feed your pet indoors or pick up the dish after they finish. Fasten garbage can lids with a rubber strap. Don't place meat products or other attractive foods in uncovered compost piles. Keep surplus bird food cleaned up around feeders. Place bird feeders out of reach of raccoons. Close openings to animal cages and pens. Close garage, storage buildings, basement, and attic doors and windows, especially at night. Close off all vents or open spaces under buildings with metal, hardware wire or boards, but be careful not to seal animals inside. If an animal is present, close off all of the area except for one small 12 inch by 12 inch opening. Wait until after dark, and then close it off. If the animal is still inside, repeat the process. If raccoons or skunks are using the site, be sure not to lock the young inside. Raccoons and skunks leave their young in the nest for 3-7 weeks. You should wait until they are old enough to travel with the parents. Prevent raccoon access to chimneys by securely fastening a commercial cap of sheet metal and heavy screen over top of the chimney. Consider fire safety first. Prune all large overhanging tree limbs that animals may use to gain access to building roof or upper floor windows and vents. If trees cannot be pruned, tack a metal band, 16-24 inches wide, around the tree trunk below first limbs but 4-8 feet above the ground.